Looking down the hillside over the picturesque resort of Puerto Rico, you'll literally be on top of the world here. These apartments are comfortable and the atmosphere is friendly and relaxed. At the very top near the europer centre what a great hotel very very clean, food was brilliant plenty to choose from. Staff excellent and couldn't do enough for u. We were all inclusive which was good value for money. Only cost 4 euros to go down to the beach, but it is walk able but need a cab to get back. If you pay £300 for a week, what do you expect..
Well don't be surprised at some of the comments that are on this site. My partner and i with our 2 children stayed here in the summer it was certainly different to the Christmas holidays we had here. We knew what were coming to so it didn't come as quite as a shock.. You pay for what you get if you pay £300 for a week, what do you expect (not 5* I'm sure). The location was fab for us.. We walked down to the beach everyday only takes about 20 minutes or you have the choice of paying about 4 euros in a taxi which come very quickly when called from the reception.. Not bad eh. We had a great banter with the staff, who unless you didn't talk to them they would leave you alone. Some people are like that arn't they. Entertainment was OK- singing and Karaoke, Someone with snakes- ok i suppose. We went out most evenings so that didn't bother us we don't like to stay in one place. We had a right down pour of rain one night.. Cleaners/maid where all there to help clean up. food was ok, full english for breakfast,the maids do a brill job, weather very hot, entertainment not good, rooms need attention and updating, lovely views but its a killer getting down to puerto rico, theres not enough to do down there, 2 many restaurants.puerto rico expensive now you will pay 3 pound for a pint of beer, down fall of hotel is the pigeons, they are a nightmare and as the food is outside even saw them helping theirselfs to the food, not nice. After reading reports on this hotel which are quite mixed I was quite optimistic about going.But unfortunately I honestly cannot believe the Tour Operators rate this as a 3 Star it should be a maximum of 2 star and that is being generous.When we got to our room it was really dirty and I had to go to a local supermarket to buy some cleaning materials. The bathroom especially the bath was disgusting with months of grime around the rim.The rooms are very basic and in desperate need of redecoration.We were half board and the food was inedible , Im really not exagerating.The evening meal for the whole week we were there was disgusting. We were served cold food , raw chicken and raw pork chops.The buffet is outside which doesnt help so you get all the flies. After collecting your food outside you go inside to eat it.The choice is very limited and the hotel mainly caters for Scandanavians and Germans.We had to eat out for evening meal every single night.We were the only British people who had booked half board , all of the other Brits we spoke to were self catering. The breakfast wasnt much better although you could just about eat something in the morning even if it was fruit.I would strongly recommend not going Half Board if you do go to this Hotel. The worrying thing is that this hotel is supposed to be all inclusive from this summer.If you have booked this I would advise you to change your hotel or if you cant switch to self catering. The staff in the hotel are not very friendly in the main. The entertainment is diabolical so you will need to go out into the resort of an evening. One of the entertainers was from Bolton and she even commented to me that the hotel was dirty and that she couldnt believe Brits are still going there. But worse than all of the above is that we saw rats running about by the smaller pool one evening.We wandered why the hotel has a lot of resident cats now we know why!! !The rep even had the cheek to look shocked as if she didnt know.I dont believe we were the only people to see them. The only thing that this hotel has going for it is the location it has breathtaking views over the resort and beach because it is at the very top of the cliff. We used to walk into the main resort each evening which takes about 20 minutes (all downhill) and get a taxi back (3.50 euros). Eating out each evening for the 4 of us which consisted of main meal each , garlic bread, bottle of wine & a couple of soft drink was on average 90 Euros which is quite expensive , but unfortunately we didnt have any choice. We also had very hot weather for the whole 7 days we were there which was great. Over all avoid this hotel if you can but if you want a good location and dont mind sleeping in run down rooms , cleaning it once you are there then go self catering. Be warned do not book a food option it really is very bad and I am being totally honest. We had never visited Puerto Rico before so when we arrived at the Colina Mar my first impressions were very good. I had e mailed the hotel before we left and I was very surprised when we got into our apartment that there was a tin of Quality Street chocolates and a bottle of red wine in there for us. The apartment itself was spacious and very clean with pleenty of storage. We had all the usual appliances in the kitchen, microwave etc. The bathroom was small but we thought this better as it gave more room for the lounge and bedroom areas. The staff in the hotel were very friendly and helpful. The pools were cleaned every day. The only thing that I would criticise the hotel for was no air conditioning in the apartments. this has been our 3rd time in 4 years.love it so chilled out. the weather was brill 7 sunny days we got. this hotel seems to miss the breezes that other hotels get as at top of the hill. the entertainer was fab ,lots of games during the day and at night, the shows at night werent too good though, as we met a few people we just talked alnight in the lounge. we noticed the resort was dead for this time of year, the europa centre was a ghost town on good friday, due to the high prices ,some pubs doing deals mostly 2.50euro a pint, 4euro a vodka, more expensive if you went down to the main town. 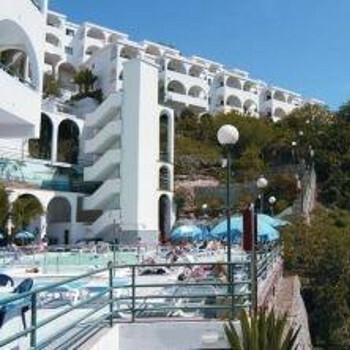 It was clean and basic.If you dont like heights i would advise against it as we were at top of hill so you would have to get the yoyo bus or taxi which was about 4 euros.Julie the entertainment was good in the day around the pool.There 5 floors at the Colina Mar but do have 2 lifts. Stayed here twice now. Great hotel, Rooms cleaned five times a week. Great views. Kids love the two pools. Bar & Pool bar prices good. Can,t wait to go back again. This was our 4th stay at the Colina Mar. The maid service was excellent as usual and was cleaned 5 days a week. The staff were very friendly especially Jose. Alan the animator was very good and tried his best to get us all involved. The shows have gone downhill though, luckily we went to the bars/shows at the Europa centre. The bar prices has also increased over the years and you can now buy drinks cheaper at the Europa centre. The hotel cleanliness is the best I have witnessed in a long time. The maids came in everyday, with the clean towels. The sheets were changed twice a week. If you needed another pillow or blanket that was catered for quickly and without a fuss. The bar staff and entertainment staff were great with adults and kids alike. The location was superb with views to die for, and with the trip in a taxi just 3 euros to the main centre, there was nothing to grumble at. We have already decided to re visit this hotel again next year!! !